Two up-and-coming Palmerston school students have made their mark at the International Secondary School Challenge cooking competition held at the Gold Coast, collecting a silver award for their efforts. Charles Darwin University VET Cookery students Jeremy Liew and Jessica Cokanauto competed against students from New Zealand, Tahiti, Taiwan and Australia to eventually gain fifth place with a combined score of 84 out of 100, earning them a “silver award”. They competed after winning bronze at the recent Nestlé Golden Chef's Hat which was open to industry professionals under 23 years of age in the Northern Territory in June. Jessica and Jeremy were the first Northern Territory team to participate in the competition. 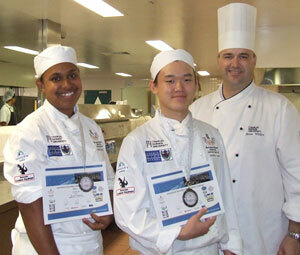 Both are Darwin High School students and attend CDU, completing their Certificate II in Hospitality Kitchen Operations. Competitors were challenged to create a quality main dish costing less than $15 within an hour. VET lecturer, Jason Wilkes said the results were well deserved and the training helped the pair to cope with the stress and scrutiny of the competition. “With the high calibre of competitors and their busy high school schedule in their senior year, they did an excellent job and I am very proud of them,” he said. The pair’s mouth-watering menu comprised pan-seared Atlantic salmon on a bed of zucchini spaghetti with prawn and chervil tortellini, roasted tomato compote and saffron beurre blanc. The event was hosted by the Australian Culinary Federation, Queensland and held at the Gold Coast Institute of TAFE on Saturday September 13. CDU thanks Skycity Darwin, Arafura Catering Equipment, CDU, Australian Culinary Federation NT chapter and the Australian Culinary Federation National chapter for their support.